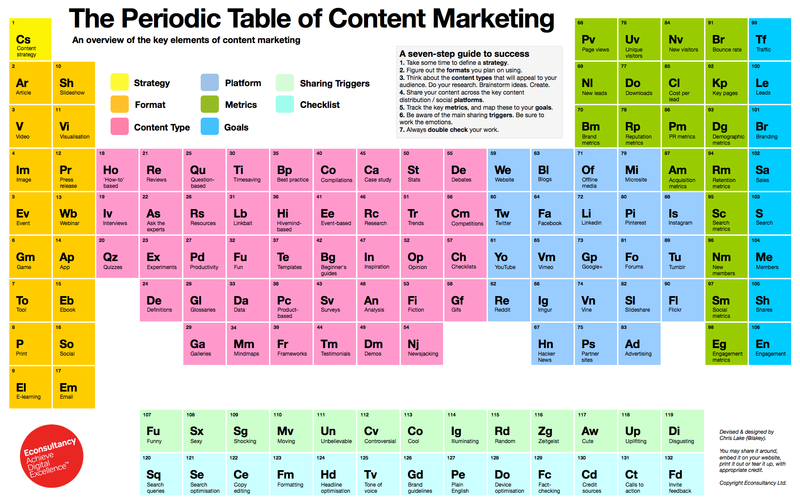 If you are a science buff or a reformed geek, you will like the Content Marketing periodic table. This chart has been around for a while since it was first published by Chris Lake. Chris and I had a recent conversation, and with his permission, we are republishing it here with our take on the 7 successful elements for content marketing success. 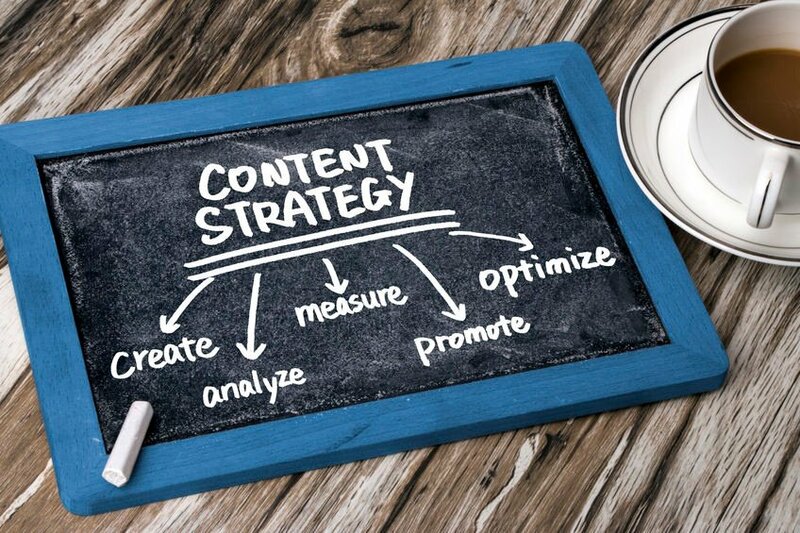 By now, you have learned that Bristol Strategy is an Inbound Marketing agency, and content is the central element of the Inbound Marketing methodology. Of course, we provide content marketing services too. When we work with clients, they frequently wonder; how it is possible to create a continuous stream of content that will be both educational and captivating? The content marketing periodic table offers viewers a visual guide to the many ways a business can provide information, in many forms for their visitors and the steps they should take to ensure the content has a positive impact on their business. Los Alamos National Laboratory describes the periodic table of elements: "The periodic table is the most important chemistry reference there is. It arranges all the known elements in an informative array. Elements are arranged left to right and top to bottom in order of increasing atomic number. The order generally coincides with increasing atomic mass." Chemists routinely refer to the periodic table in in their daily routine. The same should be true for inbound marketers as they develop and execute their content plan. 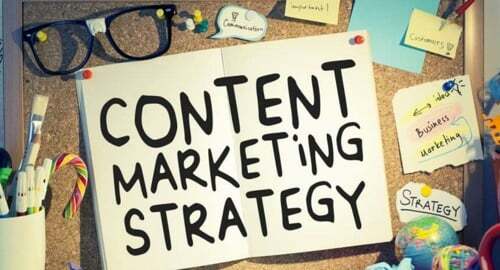 The process of creating a content strategy is quite straightforward so long as you have an active and successful sales person selling your products or services to multiple customers; then you have the core material to develop a content strategy that will address the needs of your target customer. Your sales team identifies the triggers and goals that compel your prospects to invest in your offerings. Interview your sales reps to obtain the foundation of an effective strategy. Augment the information obtained by sales through customer interviews to validate assumptions. Customer research is the most important part of any content strategy. In many cases, customer meetings are best facilitated by someone outside of your company since they are unbiased and may discover significant buyer behavior nuances. Learn why 50% of marketers don't have a content strategy. Blog articles are the fuel that attracts the visitor to engage with your website and your content. Since organic search is the optimal way to gain prospects who need a solution to a problem that your business addresses, whatever format you choose, consider sharing it through a blog article and social media. A video is one of the most engaging format types, just be sure to include the textual metadata when embedding the video onto your website so that search engines can understand and rank the video content optimally. If you have a presentation or a story to tell, consider converting it into an Infographic. Infographics that focus on a particular subject are a meaningful way to provide insight into the problems your company addresses. Learn which B2B marketing strategies produce the highest sales conversion rates. There is a significant amount of research into "How To" perform a function or address an issue. Search engines tend to rank influential "How-To" articles highly. B2B buyers frequently look for case studies that outline the effectiveness of a solution or customer stories that describe the benefits of your product or service. Interview an influential member of your industry and share that interview in a video, podcast or text format. By association with the thought-leader, your business gains perceived credibility with website visitors. Industry analysis and surveys are as old as the marketing profession itself, having emerged in the early 1900's, and are an effective way to build a case for the need for a solution like yours. And last but not certainly least, one of the most effective formats is the blog itself. One significant benefit is that a blog speaks the same language as search engines, text. Whatever your choice of content type, select different ones to maintain readership interest. I like to categorize the three types of media platforms as 1) Owned Media, Earned Media, and Paid Media. Each of these media types includes several platforms for sharing your content and raising the visibility of your company. Owned Media is website platforms where you control the content. Good examples of this are your website and your social media company pages. Earned Media are those places where a third party says something nice about your business. It could be a positive reference on a shopping site, a Twitter re-tweet, a Facebook like or a Google Plus +1. Paid Media are the many ways you can pay for exposure to potential buyers. Google AdWords, Facebook, and LinkedIn advertisements are excellent examples. 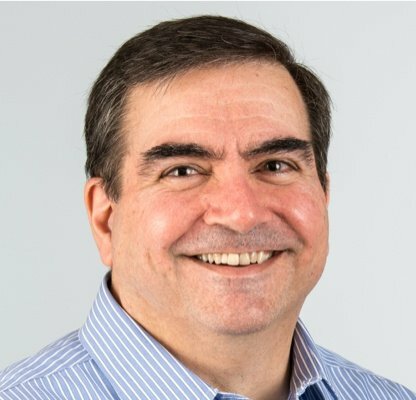 Within the paid media space are new techniques for targeting specific prospects - often called "Retargeting." The Inbound Marketing methodology and the content you create to fuel the inbound engine create fantastic opportunities to share content. Learn the B2B social media strategies that work. Marketing gurus have always said, "Spend as much time creating the title of your content as you do on the content itself!" After all, if the visitor does not click the link to read the article you spent hours researching and writing, then all of your efforts have gone to waste. There are many strategies to create titles that engage visitors and peak their curiosity. Our friends at IMRCorp, a partner Inbound Marketing agency, have come up with the "23 templates for really frickin' awesome titles, headlines, and subject lines." Afterall, it is the ability to find the right triggers that influence the buyer down through the marketing funnel that is the primary objective of Marketing. Inbound Marketing delivers results 24 x 7, so long as the content, workflows and SEO are configured correctly. There is a multitude of details that challenge even the most experienced Inbound Marketer to keep things right. Maintain a checklist of actions and double check them with each and every Inbound Marketing campaign. A good piece of content motivates readers to do something next. People should know how to proceed the moment they have reached the end of a piece of content. As long as creators produce sensible material that visitors want to consume, the marketing results will be exceptionally good. Since Inbound Marketing always begins with a great content strategy, learn how Bristol Strategy can help you business develop a content strategy that is unique to you and impactful for your business.